Hate-filled booklets that contain cartoon drawings which insult Islam have been hand-delivered to Muslim families. The booklets came in handwritten addressed envelopes sent to six houses. In the cartoon story a father who stands with a mosque in the background tells his son(SIC): 'They're praying to their moon god, son'. The father and son are then threatened by a man wearing an Arab-style headscarf who says (SIC): 'The holy Koran says I could KILL you for saying that. 'We expect a Muslim flag to fly over the White House by 2010. 'Think it's impossible? England was our first target. The booklets were hand delivered through letterboxes at six addresses in Preston, Lancashire - all of which were Asian Muslim families. Lancashire Police confirmed that the force was investigating the reports. Pav Akhtar, 40, who was among those who received the booklet, said none of his white or Sikh neighbours had received them. 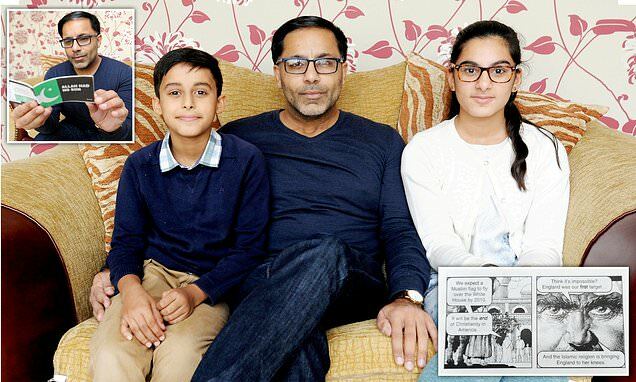 Pav, who was staying at his mother's address, said the mail was picked up by his niece and nephew Sehr, 11, and Shahzaib, 10. He said: 'The children feel nervous and unsure.